Sail, Ahoy!" On this day, November 20, 1759, the royal navy ship Arundel spotted unidentified sails. Captain Charles Middleton cleared the deck and ran out his guns. But rather than fight, the unidentified ship hove to and allowed herself to be boarded. She was the Swift of Bristol, a slaver. Soon Middleton asked his surgeon, James Ramsay, to go aboard. Ramsay would never forget the horrors he witnessed. A foul stench met his nostrils as he stepped aboard. African men and women were packed like sardines into his hold. He could barely force himself to climb below where naked slaves wallowed in blood, feces and vomit, gasping for air. Plague had broken out. Ramsay did what he could to ease their suffering. Inwardly he vowed that he would do something to end the dreadful practice of slavery. But what could he, a lowly surgeon do? As he reboarded the Arundel, he slipped and broke his thigh. This seemed to be God's way of moving him into a new capacity, for when his leg healed, he was so lame that he could no longer serve aboard ship. Every step he took on the rolling deck endangered his life. Unknown to Ramsay, friends had arranged a lucrative partnership for him. He turned it down. He had in mind to fulfill a childhood dream and become a minister. After study and ordination in England, he sailed to St. Kitts in the West Indies to take up duties as a clergyman. His congregation appreciated his medical skills but soon were on the outs with him because he opened the church to slaves and prayed for their conversion. As a result of his "offenses," Dr. Ramsay endured of threats and humiliations. He was denounced in his own church. Enemies said that he was unfit to preach to whites; they should send him blacks. He replied that the souls of the poorest blacks were priceless and he would gladly preach to them. But, worn down by opposition, he finally admitted defeat after twenty years and retreated to England. In the homeland, he found no personal peace. 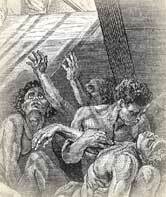 The shocking sights of the slave trade remained with him. He told friends he'd seen slaves whose hands were chopped off with axes when they were unfortunate enough to tangle them in the gears of sugar presses. Others were burned to death by angry masters. His friends pleaded with him to document these facts. Ramsay hesitated. He knew the planters would stop at nothing to close his mouth. Finally he agreed. Dipping his quill in ink, he produced an Essay on the Treatment and Conversion of Slaves in the British Sugar Colonies. Considered the opening salvo in the British campaign to abolish slavery, it was a best-seller from the moment of its publication. As Ramsay expected, slave owners attacked him in press and Parliament. He had to defend himself against false charge after false charge. When he published An Address to the Publick, on the Proposed Bill for the Abolition of the Slave Trade pro-slavery forces made a new attack on his character in the House of Commons. Ramsay could bear it no longer. He sickened and died. An enemy gloated, "Ramsay is dead--I have killed him." Morgan, Robert J. On This Day. Nelson, 1997. Pollock, John. Victims of the Long March and Other Stories. Word Books, 1970. "Ramsay, James." Dictionary of National Biography. Edited by Leslie Stephen and Sidney Lee. London: Oxford University Press, 1921 - 1996. Shyllon, F. O. James Ramsay: the unknown abolitionist. Edinburgh: Canongate, 1977.